As part of a larger project to further develop Brooklyn Bridge Park, the new Brooklyn Pierhouse is being built near one of the entrances to the park. The two structures will house both condominiums and hotel suites overlooking Manhattan. As part of the construction process, 88 holes needed to be core drilled into the existing slab, while taking care to maintain the integrity of this brand new waterfront structure. Diferro Contracting contacted GPRS to use Ground Penetrating Radar (GPR) to locate any rebar and utilities running through concrete slabs. 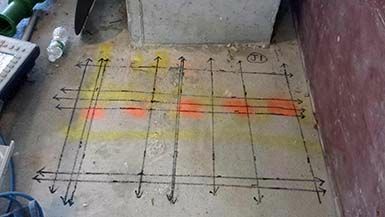 Technicians Ken Williams & Jim James were able to use GPR to essentially “X-Ray” the slab to provide rebar locating. The rebar was laid out directly on the surface and Diferro was able to easily place their core drilling locations without compromising any rebar. If you are interested in obtaining more information or a quote please visit our Contact Us page for a local representative near you.